Family-run machinery movers, James Garside & Son of Boothtown, near Halifax in West Yorkshire opted for power and performance when it ordered a new Volvo FH13.540 double-drive tractor unit for its transport operations working across the UK and moving anything from single machines right up to full factory relocations. The new 80-tonne arrival comes with a Globetrotter Cab and the 6×4 prime mover is powered by Volvo’s D13K engine producing 540bhp. The 3,200mm wheelbase chassis was specified with rear air suspension, a rear bogie capacity of 23-tonnes and a ten-tonne front axle. Garside also opted for Volvo’s I-Shift Crawler automated manual transmission system with deep multi-speed reverse gears. 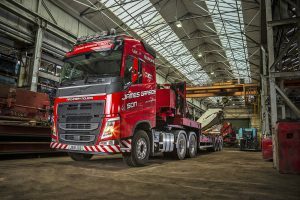 Director Andrew Garside said: “We use a three-axle step frame trailer, equipped with a crane, so when the time came to replace a lorry on the fleet, we chose the FH13.540 for the power it brings. Supplied by Crossroads Truck and Bus in Birstall, the truck also comes with a vertical exhaust stack and Alcoa Dura-Bright EVO alloy wheels to complement the company’s red painted cabs.